Over time, despite everyone’s best efforts, the teeth can often fall victim to decay, damage, or even go missing altogether. If you or your child have a smile that needs a little TLC, you’ll find the solution right here in Salem at Cochell Family Dentistry. Using advanced techniques and evidence-based materials, Dr. Travis and Dr. Christel Cochell can restore many dental problems while working to meet your esthetic concerns. To learn more about your restorative options or start getting the dental care you need today, please give us a call. Whether you have a large cavity, fractured tooth, or a gap in your smile, crowns and bridges can be a solution. All our restorations are designed to meet the goals of each patient, so that in the end, they're functional and blend in with your existing smile. 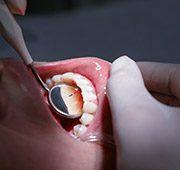 In addition to using a traditional amalgam filling, we also offer a more esthetic option to repair a cavity. 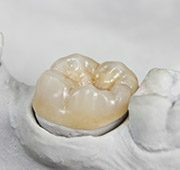 Using composite resin-based fillings, we can restore a tooth in a way that is both natural looking and strong. Multiple missing teeth can make even the simplest tasks like eating and speaking unpleasant. Our custom-made dentures and partials can help patients regain their lost oral function and confidence at the same time. 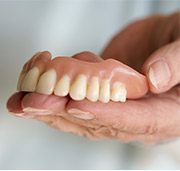 Modern-day dentures are smaller, sleeker, and more lifelike than ever, so whether you’re missing just a few teeth or an entire arch, we can ensure that you’ll walk out of our office with a strong and beautiful smile you’re proud to show off.